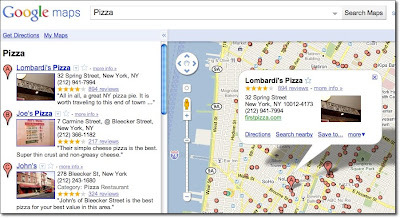 about how to create a clear and effective business listing via Google Places, we’ll help you to determine if Google Places is right for your business. 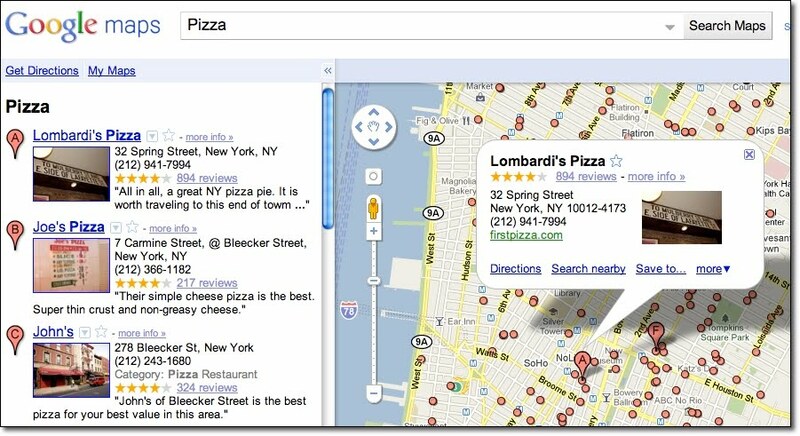 Google Places is meant to facilitate customer interaction with brick-and-mortar businesses and service providers. Therefore, the business owner or employee who is officially authorized to represent their particular business location must have a physical address in order to comply with our quality guidelines. Having a physical address means that your business has a specific location (typically including a street name and a street number), can be visited by potential customers or business partners, and has a specific phone number at that location where you can be reached during operating hours. 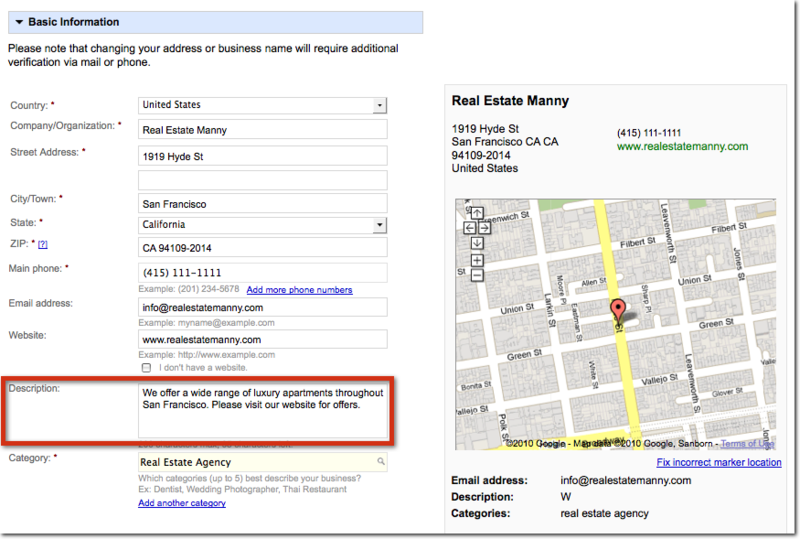 Including your physical address in your free business listing helps customers figure out where they can find you. For operations like these, rather than appearing in Google and Google Maps search results associated with a physical location, other online tools might better fit your needs. One option is to advertise and generate awareness about your business activities through Google AdWords. This cost-effective program enables you to get the word out about your business, website or event via online ad campaigns, and does not require you to have a brick-and-mortar business address. If you’re a business with a physical office location that is open to customers and staffed both in person and via phone during regular business hours, we encourage you to create a free listing by signing in to Google Places here. 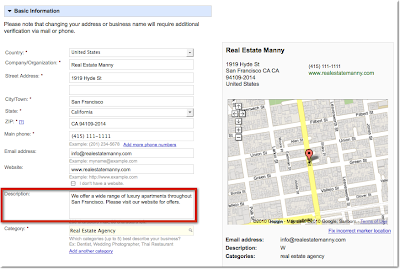 For example, a real estate company with a corporate office can add the services it offers, the apartments it sells, and so on in the description field of the listing. Be careful to create just one listing per physical location and to create listings only at places where your business is actually located. For example, if you run a DJ service and your office is at 41 Broadway in New York, you should only add that location in Google Places, even if you also DJ at 32 Main Street and at 14 Smith Street. For businesses that have one physical location but also offer their services elsewhere - such as the aforementioned businesses as well as locksmiths, translation services, delivery pizzerias, cleaning services and the like - you can use the Service Areas feature in your Google Places account. Marking a service area enables you to show your potential customers the range of places where you work. Businesses that require travel to meet customers can define a radius around their main location or select specific areas they serve. If your main location is your home address and only used to receive business-related mail and phone calls, you can also hide that address and only show the service area in which you operate. This might be the case for babysitters, DJs, household services or IT repair services. Detailed instructions about how to set up this feature can be found in our help center. Taxi and courier companies are particularly good examples for the use of the Service Areas feature. They offer a service that is location-independent and therefore shouldn't be associated with fixed locations on Google Maps. Even if you can find taxis often in front of train stations or airports, these are not locations owned by the business. The service area feature allows taxis to indicate the area in which they operate. If the taxis are coordinated over a dispatch centre, that can be listed as one physical location, otherwise the address should be hidden. 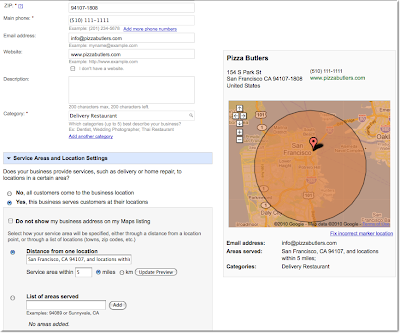 In order for your free business listing to appear on Google and Google Maps, you must verify your business via Google Places. This simple process includes providing a verification code by mail, automated call or text message. The phone number used for this process will be shown in your listing, so be sure that the number directs calls to your business. 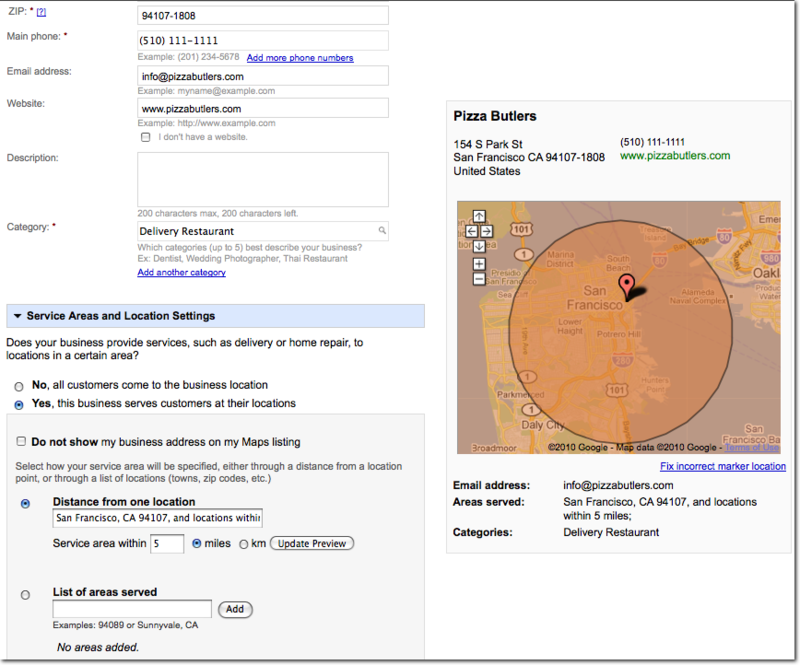 We hope this information helps to explain our Google Places quality guidelines around setting up a free business listing. If you have any further questions about the types of businesses that are eligible for inclusion in Google Places, please visit our Google Places help forum. Are you curious about what kind of businesses are eligible to appear in the free listings that appear on Google and Google Maps? In this second post in our blog series about how to create a clear and effective business listing via Google Places, we’ll help you to determine if Google Places is right for your business.